Giveaway #2: Room Submission + Design Camp Winner! Y'all, I had so many entries for this giveaway that I didn't think it would be fair for me to pick one, so I let random.org do my work for me once again. And, yay! Excitement! The winner of the room re-vamp and camp giveaway is MEGAN. Awesomely, today is also Megan's birthday! Happy birthday, Megan. I hope this is a good present. 1. What is the PURPOSE of the space? To eat in and to be a main passageway connecting two of the biggest rooms in the house (living room and family room). That's about it. We don't need the table to do double duty or anything like that (like for homework or crafts or any of that shiz) -- we just need a dedicated space to eat all of our meals. It's connected to our kitchen through a doorway on one side, and to a hallway/bedrooms on the other side. Both ends are wide open (except for the white built-in shelves you see at the far end). There are four of us (plus our dog, Shorty and our guinea pig, Brian, but they don't sit at the table) -- my husband and myself, and our two boys, ages 7 and 9. We sometimes squeeze up to eight people at that table, three on each bench and one on each end, but it's not that comfortable. 2. What are your most pressing NEEDS for the space? The biggest issue with this dining space is that it connects the front of our house to the back of our house. So it needs to have some flow. I'm sure this is all kinds of wrong as far as feng shui, but it can't be helped. We need to be able to easily walk through our dining room, all the time. And we really need to be able to have a bit of storage in here (not sure it's possible), for dishes and the like, as well as seating for four regularly, and at least eight occasionally. Because my kitchen is so small, many of our dishes and serving pieces are stored in our mud room currently, which is so not convenient. Also, we need better seating -- those benches are pretty annoying and heavy, especially to any elderly guests we might have over. And the table is a dark beast. 3. What would you like the MOOD of the space to be? Hmm, the mood. I love a white + wood + green vibe, with a good dose of nature and a pinch of yellow and black tossed in. My grandmother always said every room needs something black in it. 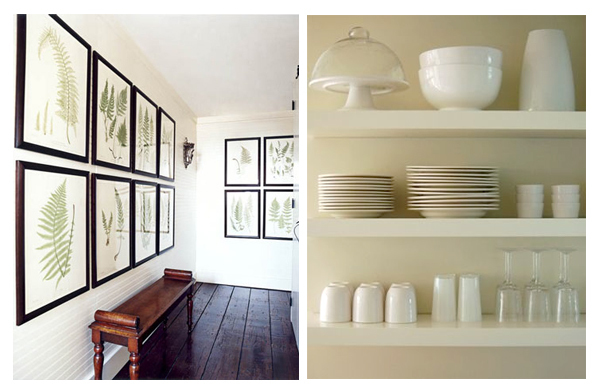 A space with simple lines -- maybe a neutral base of white walls. Think "Amish botanical". And I do love a good Thonet-style chair. I'd like it to kind of flow from the living room (which you don't see in the photo, because it's behind me), which is pretty neutral with white walls (except for one wall, which is wallpapered with Cole & Son 'Woods' in taupe/cream), a white sofa, and gray chair with bits of green and yellow thrown in. And you see the dining room as soon as you walk in the front door, so I'd love to have the light fixture make you swoon when I open my door to you. Structurally, the first thing I would do is remove the white shelves on either side of the archway. They are not really serving any purpose, and they are blocking your egress in a big way. A handyman (or you!) could do this in an afternoon.The hardest part would be patching/re-painting the molding where the shelves were nailed in. I would also remove the corner chair, as it is also taking up valuable pass-through space. I would not remove the dog: he is cute. 1. You really have no other light source in the room except for the overhead light. And since you don't really have the space for a piece of furniture that could hold lamps, I would recommend some wall lights. The ones I have chosen -- by George Kovacs -- are awesome because they don't have to be hard-wired; they come with a cord cover and can be plugged in. But you can certainly hard-wire them if you like. And in that case, you should put them on a dimmer. 2. These paint colors are Benjamin Moore Witching Hour (top) and Benjamin Moore Super White (bottom). We'll come back to this. 3. Before I even noticed that you already HAD Cole & Son Woods wallpaper, I thought: "You know what would be PERFECT for this room? Cole & Son Woods wallpaper." So I am going to ask you to take a leap and use the same wallpaper in both places. The one I have chosen is sort of the reverse of the one you have, except with black, so I think it will be different enough, and yet add a nice continuity. 4. I also want you to paint the ceiling black and the floors white. I know. I'll let that sink in. My reasoning for the floor is that a rug, which I would normally recommend, will be tripped over at all times by your family passing through the room. But a white floor will add that texture + interest to the space without using a rug, and it will be so totally Scandinavian-Amish-minimal. Also, it's a really tiny floor to clean if the floor gets dirty. And a really tiny floor to strip if you hate it, which you won't. In fact you will probably want to paint more floors in your house, so this is basically a gateway floor. I am sorry for getting you addicted to drugs. 5. This Orbit chandelier is so, so good in person, and is relatively affordable compared to other high-wow-factor pendant lights. It's white, although it looks silver in the photo, and it should also be put on a dimmer for maximum ambience. I have one in my house and I love it a lot. And Miss SF Girl By Bay -- who is basically taste personified -- has one in her dining room and it is really gorgeous in there. 6. Your big, dark wooden table is beautiful, but I would love to streamline the space with narrower, more airy-type table. This one, the Woody Dining Table from CB2, fits the bill perfectly: it's 36" x 72", so a bit narrower than your existing table, and much lighter-looking. 7. Chairs: How about 2 black Eames eiffel chairs on either side of the table, and a fabulous green Thonet at either end? You can get Eames reproductions just about anywhere, and it doesn't bother me a bit that they're not real ones or whatever. Who cares? You have two boys. These are made of metal and plastic. The end. The Thonets, however, I would order from DWR, because they cannot be reproduced and also they are on sale right now. Go get 'em! As for bringing in some botanicals, I would love to see the ones you have framed in black, or a set of smaller ones framed in a grid pattern, as above. If you use different botanical prints (I love the ones with the black backgrounds), that is where you can bring in your touches of yellow. You can also use one of your old benches, which don't appear to be too wide, for extra storage/seating/whatever. I'd place one of the wall lamps on either side of the prints. On the other side of the wall, maybe three narrow shelves for dish storage? They can be floating like the ones in the above photo (IKEA has tons of them), or you can make them yourself with inexpensive shelf brackets and painted wood. And that, birthday girl, is all I would do. It is clearly a total redesign of the room -- you don't really get to keep anything that is currently in it -- but it is fairly straightforward, packs a major punch, and will look great with the rest of your house. And it will KILL from the front door walking in. Thank you so much for your submission! I had so much fun re-imagining it. Everyone wish Megan a happy birthday and a happy dining room! I'm out. No, for real, I have to go pack for Seattle.